A high-capacity industrial conveyor-fed shredder combining fully-automated features with the rugged strength needed for high volume centralized shredding. The SX-89 can shred stacks of computer forms, cardboard, tapes, ribbons, CDs, magnetic disks, and entire files up to 650 sheets. 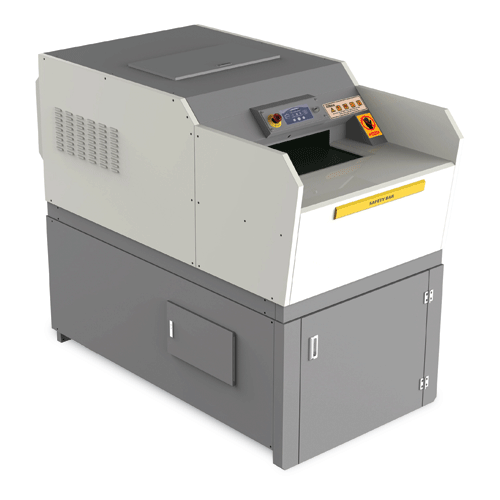 The SX-89 industrial conveyer belt shredder’s features include an LED control panel with load indicator and user-friendly features such as Auto Start/Stop, Auto Reverse, and Auto Cleaning. The Automatic Oiling System lubricates the all-steel cutting blades, helping to keep the industrial conveyer shredder in peak operating condition. A large safety bar is located in front and will shut down the shredder instantly when pressed. A lock and key system is also included to ensure the industrial conveyer belt shredder is operated only by authorized staff. Front Waste Bin access and Mobile Waste Bin on casters. An optional Output Conveyor Belt System increases capacity by transporting shredded material for collection in an external waste bin. Lifetime Limited Warranty on cutting head.